Hillsboro’s Kristin Jamieson (left) and Head Coach Nathan Boatman are pictured at Eagle Sticks Golf Club on Monday where Jamieson competed in the D I girls golf district tournament. ZANESVILLE — On Monday Kristin Jamieson of Hillsboro High School traveled to Eaglesticks Golf Course in Zanesville to take the next step in her journey back to the Division I girls State golf tournament as she competed in and won the Southeast District girls golf tournament by a whopping nine strokes. Jamieson carded a 65 on the day and shot 29 on her front nine and 36 on her back nine holes. The closest competitor to Jamieson at the event was Dover’s Chloe Crone who shot a 74 at the 18 hole tournament. With the win Jamieson earns her third consecutive trip to the State tournament that will be held Saturday, October 20, and Sunday, October 21 at the OSU Gray Course on the campus of Ohio State University. The girls golf team from New Philadelphia earned a trip to the State tournament as the top finishing team in the District tournament with a score of 327. New Philadelphia was led by Kayla Dyer who shot a 79 for the day and recorded a 42 on her front nine and a 37 on her back nine holes. Fellow Frontier Athletic Conference member the Miami Trace Lady Panthers were also participants in the tournament and finished in sixth place with a score of 449. The Lady Panthers’ scorers were Alyssa Butler with a 110, Meri Grace Carson with a 111, Libby Aleshire with a 113, Regan Hagler with a 115 and rounding out the scores for Miami Trace was Makayla Barnes with a 128. Jamieson has had an excellent 2018 season as she led the Indians boys golf team to the FAC championship and earned golfer of the year honors in the conference. 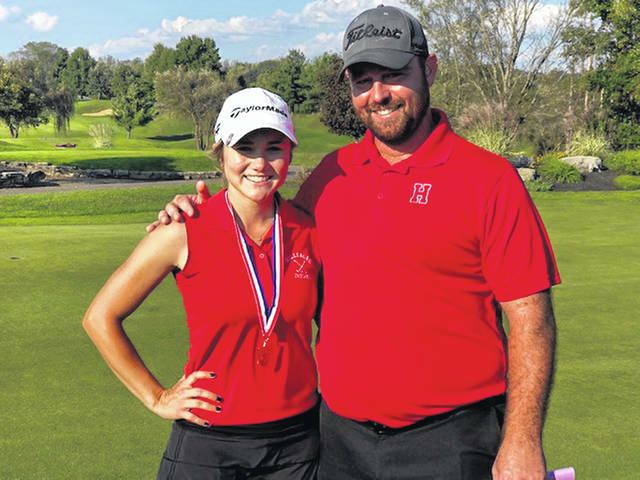 https://www.timesgazette.com/wp-content/uploads/sites/33/2018/10/web1_Jamieson-at-Eaglesticks.jpgHillsboro’s Kristin Jamieson (left) and Head Coach Nathan Boatman are pictured at Eagle Sticks Golf Club on Monday where Jamieson competed in the D I girls golf district tournament.